Demolition. Buried roads. Lakeside locations. Commuter ferries. Mid-rise buildings. Landscape. Vast public realm. Ground floor shops. Permeable courtyards. Boardwalks. Setts. More landscape. Pastel render. Solid windows. Expansive balconies. Flashes of colour. Underground recycled waste. 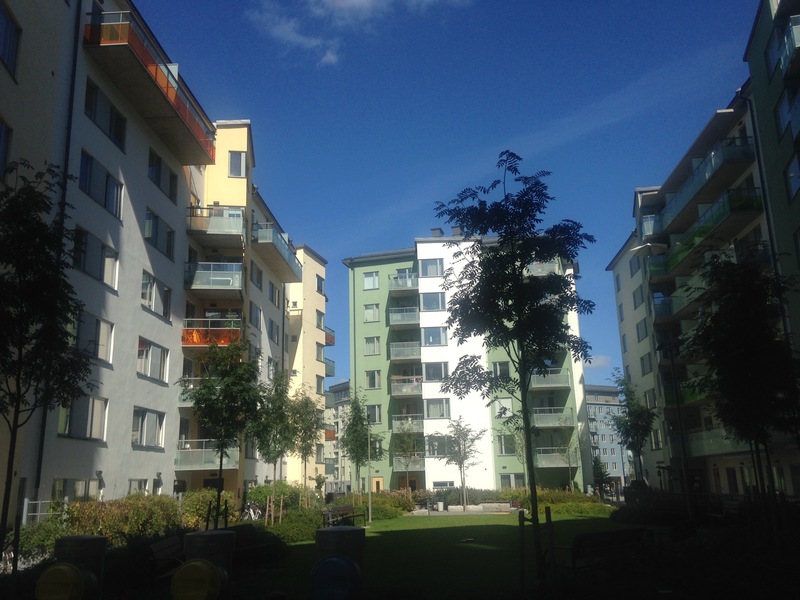 This is the recipe for Swedish regeneration – but it’s cheap to be facetious when faced with scheme after scheme of competently executed urban planning. Stockholm has for 20 years been rediscovering and rehabilitating idyllic ex-industrial locations throughout its compact and compellingly scenic city area. Tree-covered rocky slopes and shimmering lakes with boats of all kinds are abundant and standard within 6km of the city centre – places which would be luxury destinations in world cities and inaccessible to many. (Stockholm’s suburban locals were taking full bikini-clad advantage of this spectacular amenity in the 26 degree sunshine we enjoyed this week.) But the Swedish ‘city extension’ formula can and does get spoiled by bad ingredients, watering down and fattening up. 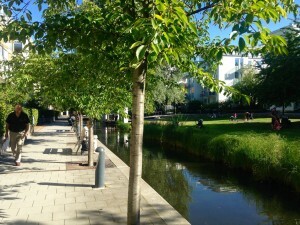 Hammarby Sjöstad has been visited, written about and photographed to death by worldwide professionals and civil servants, eager to bottle some of the joy and wellbeing which it exudes (as well as the green credentials) and spread this in their own city. This 12,000 home area (100 homes/hectare i.e. very dense by non-urban standards) has been delivered at an incredible rate of 800 homes per year by a diverse (but very local) set of developers and architects, orchestrated by the city. The masterplan evolved from a number of city-led workshop meetings involving several design and technical actors; this democratic and ego-suppressing design process is difficult to picture for a UK professional. A walk through Hammarby’s glorious and variegated landscapes in the sunshine is a rich experience, enjoyed by residents and visitors alike, especially children (who abound, though the city had thought the area might attract older residents). 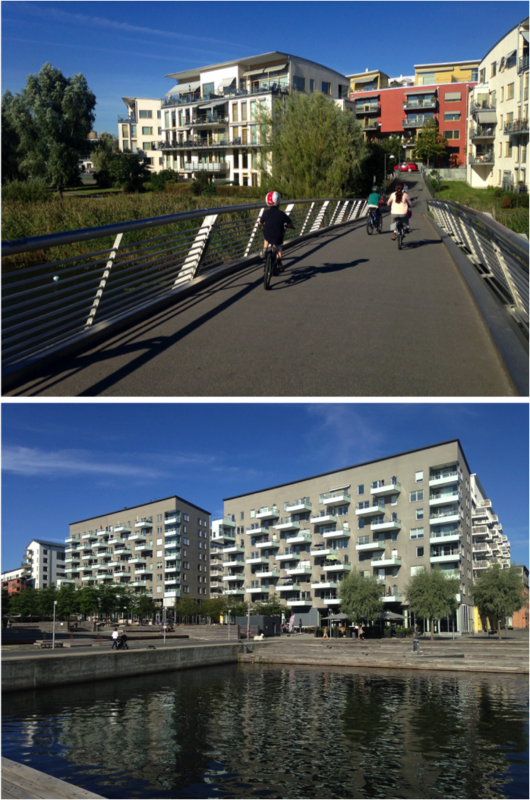 Hammarby is largely a 5-6 storey environment, with taller buildings (by new architects) emerging more recently as younger city clients became frustrated with the ‘vanilla’ approach to urban design. Resident management groups are formed for each city block and they take control of their own building and landscape; the city maintains the ribbons of park and canal which run between. 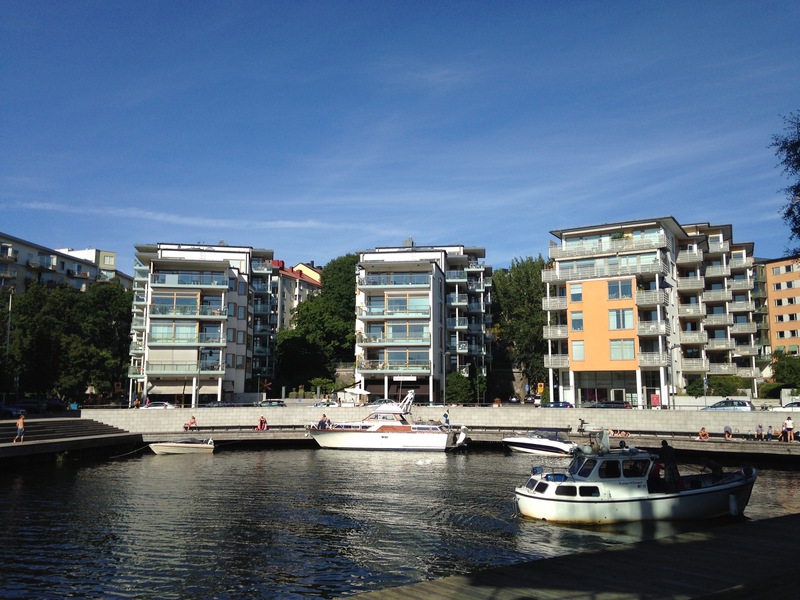 My sense is that Hammarby Sjöstad is the pinnacle of expression of the Swedish regen template, benefiting from a high level of investment in external materials, architectural variation and public realm. But it came first in Stockholm – has it set too high a bar for other schemes to reach? 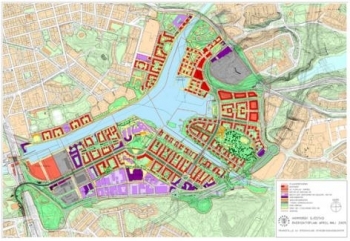 Four other new areas have emerged in recent years in Stockholm: Norra Kungsholmen, Lilla Essingen, Liljeholmen and Royal Seaport. Compared to Hammarby, the buildings in these locations are taller and closer together. Courtyards are tighter, harder and less designed. Elevations are cheaper, greyer and simpler. Landmark ‘point blocks’ have appeared in the later schemes too, much disliked and again, not good enough for the impact they create. The granite setts finally ran out at Liljeholmen, whose broad lakeside walkway is a bleak concrete experience with too few trees and under-scaled public furniture. The street-based gridded masterplan is therefore simply not strong enough in its own right to secure quality and a feeling of place. A lot can be lost via two routes: over-developed plots and under-investment in the materiality of the buildings and spaces. Royal Seaport learned some key lessons from Hammarby though, including mixing in students, grads and older people from the start rather than ghettoising. The city also extends a personal welcome and lessons in green living to each resident on arrival, knowing that green buildings alone are not enough to ensure lower consumption. It’s working: energy consumption is at about 40% of the norm. (I found it very surprising that whole blocks are charged for their district-supplied energy use, not individuals. Whilst this creates some lively competition between blocks, it surely can’t incentivise energy-conscious behaviour?) The Royal Seaport city client also runs mandatory, formal ‘competence sessions’ for their appointed developers to ensure that innovation and learning is disseminated amongst the many parties building out plots – sessions which are willingly attended. There is even a logistics area for the many simultaneous construction sites where deliveries are coordinated across all developers and truck movements reduced. That felt impossible to me (and to the constructors initially), but is actually working! The heritage buildings at Royal Seaport (brick gasholders, early 20th century housing estates) are stupendous as well and are staying: another lesson from Hammarby where perhaps too many industrial buildings were lost to the march of the masterplan. PS: We spent two evenings eating, drinking and people-watching on the waterside at Hammarby. For my money, it had a somewhat sterile, ‘Truman Show’ atmosphere. Sorry. I have mostly found visiting ‘exemplar’ large scale housing developments to be rather disappointing. Hammarby is one of the most lauded, and whilst in British terms is immensely impressive, still does not live up to it’s star billing. I found that its integration with its surrounding residential areas to be weak and rather unwelcoming. However placing the tram along the central spine was, immensely positive and really helped the mixed uses along this street. Any reflections on whether designing for a far colder climate has had any impact on the urban design or architecture?